I need someone to create some manual journal entries for electricity A/C (expense A/C), Gas (expense A/C), and accrued electricity and gas A/C (liability A/C). Period is from 1 may 2018 until and including 31 Aug 2018. 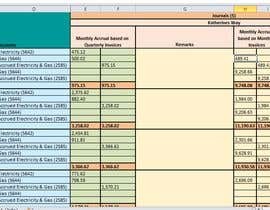 There are 4 different types of invoices received from energy provider (AGL) - 2 bills are received quarterly, and 2 bills are received monthly. Please go through the attached excel. Sheet-2 - Few journals made by our accountant (This is a sample for you.) But keep in mind that these journals might not be accurate. Sheet-3 - Calculations made for the different types of invoices, this will help you to make the journal entries in Sheet-1. You can modify sheet-3 the way you think is correct. Sheet-4 - Information regarding 4 types of invoices we receive (3 invoices are for gas and 1 invoice is for electricity). This is a contest, hence I shall be comparing the work of you people. This work can only be done by someone who has accrual accounting experience. A qualified CA/CPA/ICAA is preferred, but not mandatory. Experience is very important. Work needs to be 100% accurate. The person who will win this contest will receive lots of other accounting work from me. Remember, everytime an invoice is paid and closed, a payment journal is made by the accounting software and posted. Hence, your manual journal entries must not include bank. Only 1 person wins contest. However, even if someone does not win contest but his work is 100% accurate and has good communication skills, there is good chance I shall hire him/her as an hourly accountant for my other assignments. Hence, try to give your best effort. Hi Guys, project description has been amended. Can you explain what is wrong? Expenses are increased and so debited and liability (Accrued) increased so made credit? I can assure that there is some misunderstanding. Also, if there is any payment made for these accruals? Where can I track that from? Its completed but you just said that I can use monthly apportionment in sheet 3? But then you just said that sheet 3 might be wrong? Can you tell me which sheet should have accurate data which I can rely on? Its completed from my end by the way. Just confirm this point so I can send you file. Just one question; would you like to make all the accruals posting as a single account or each accrual must be disclosed separately in entries? I am going to upload the file here very soon. I don't have the option to bid however, I can only directly submit my entry. I think that is how the contest works here. Correct me if I am wrong. I am a qualified Financial Accountant and have been working with one of the Big 4 Audit firms so this is a really simple stuff for me. Would you prefer automation in journal entries with respect to amount, calculations and/or debt/credit entries? Or you would like to enter data manually?